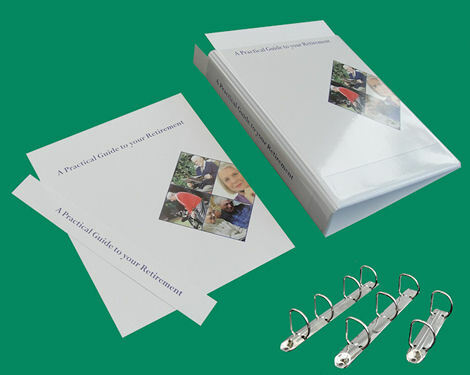 A5 Presentation Ring Binders - PVC. Now available from Plasart Ltd.
A5 presentation ring binders with a clear PVC pocket, open at top, on front and spine for you to insert title sheets. A clear diagonal, vertical or horizontal pocket (for loose sheets etc.) is an optional extra. These are not a stock item but made to order for you, usually within 7 working days, in a range of colours and ring capacities. A5 presentation ring binder. White binder shown, other colours are available. 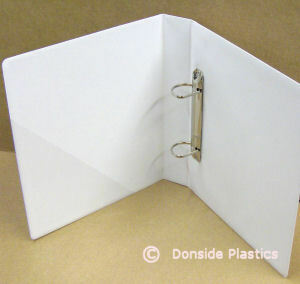 A5 presentation ring binder showing 2D ring mechanism and clear diagonal pocket.